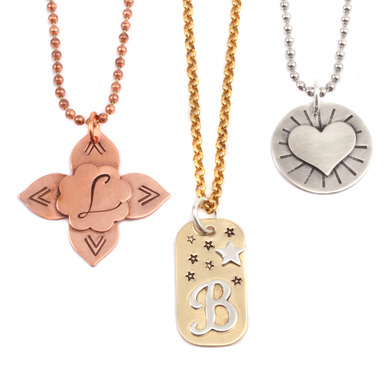 Personalized jewelry is all the craze, and Lisa is going to show you some great stamping designs to incorporate into your jewelry. Not only does she cover a lot of great designs, she also introduces you texture, shape, and layers - to take your designs to the next level. These new techniques will give your stamping projects a little extra something special. 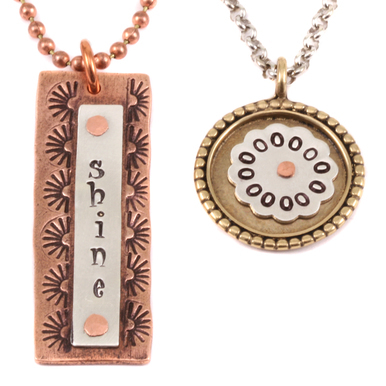 Join Lisa for this free class filled with designs to expand your stamped jewelry repertoire! This class has a running time of 9 minutes. Variety of stamping tools Lisa shows many different designs in this class, we recommend you watch the class before purchasing your tools. Variety of blanks Lisa shows many different designs in this class, we recommend you watch the class before purchasing your materials. After I watched this video I stayed up half the night thinking of all of the designs that I could make stamping. :) And that is just what I love about these videos, they are so inspiring and educational at the same time. Thank you Lisa. Lisa did not disappoint! So many ideas; not only for jewelry, but decorative gifts as well. I think I'll try my hand at making the ornament for early Xmas gifts. The link bracelet at the very end was just darling. Lots and lots of ideas that you can incorporate stamping. Thank you so much Lisa and wonderful Beaducation classes!!! This class was a very excellent demonstration of what you can come up with using a few techniques. It's a great class for all skill levels and has me thinking of some new projects I'd like to try incorporating all. Lots & Lots of Inspiration!!! Thanks Lisa for all the great ideas! I love watching Beaducation videos as they are always chock full of technique and variations. A fantastic gallery of design ideas to spark the imagination! Well worth the time to watch. Be prepared to have it occupy your mind dreaming up fun creations.